This timely compilation of infrared standards has been developed for use by infrared researchers in chemistry, physics, engineering, astrophysics, and laser and atmospheric sciences. 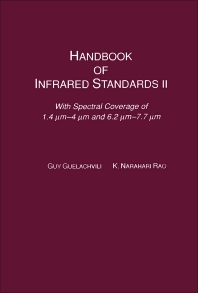 Providing maps of closely spaced molecular spectra along with their measured wavenumbers between 1.4vm and 4vm, this handbook will complement the 1986 Handbook of Infrared Standards that included special coverage between 3 and 2600vm. It will serve as a necessary reference for all researchers conducting spectroscopic investigations in the near-infrared region. Atomic and molecular physicists, astromoners, spectroscopists, atmospheric physicists, graduate students and postdoctoral associates in the above disciplines, and research institutions and industrial organizations, including NASA and NOAA. Introduction. Maps and Wavenumber Tables for the New Spectral Coverage: 1.4vm-4vm. Heterodyne Frequency Measurements. Saturation Absorption Spectroscopy: Update of Oso4 Measurements. Methyl Chloride Spectral Maps and Wavenumber Data: 1309cm-1-1594cm-1.